You are here: Home / Blog Post / Consignment items for fundraisers are plentiful. Even when you order less. Consignment items for fundraisers are plentiful. Even when you order less. In two weeks, I’m teaching a FREE teleclass on auction procurement and how you can get donated items without leaving your house. I’ll be writing about procurement until then. Today I’m sharing a short story about consignment items for fundraisers. Here’s a quick story about consignment that clients tell me again … and again … and again … and again … and you get the idea. 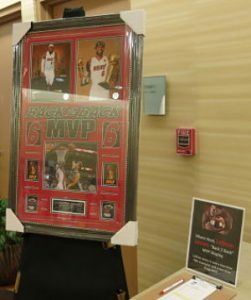 While working for a small gala in Florida recently, I was surprised in the silent auction room. Given the crowd size and overall size of the silent auction itself, there were a lot of sports memorabilia items. Way too many. Knowing that the group had a connection to the Miami Heat, I didn’t look too much at those items. But good grief … all this other stuff?! The nonprofit was sent over 30% more items than they’d ordered. I can’t tell you the number of times I’ve heard a client share a similar story. In the last minute rush to finalize everything, my client couldn’t avoid this … but here’s a suggestion if this happens to you: Don’t include extras. Some consignors may urge you to put out everything, reminding you that you’re not being charged for it unless it sells. But having all that extra stuff on the table does hurt you. It doesn’t hurt the consignor (they stand to gain from the extra visibility in dominating the auction; they have better odds), but it impacts you in other ways. Most groups are trying to sell too many items in their silent auction anyway. Adding more stuff reduces the competition for the merchandise you DO have. High supply and low demand deflates prices. Space is often in short supply in silent auctions. Items get cluttered as there is not enough room or tables to properly display everything. Instead of having nice displays with good spacing, your silent auction displays cramp up, resembling a garage sale. Do people spend a lot of money on items at a garage sale? Not where I’m from. You’re setting yourself up for failure by presenting items as if you are a garage sale. Crowding devalues all items. Having more items is more work for your display team. Even if you’ve got the space, you’re now taking their time and energy to get the bid sheets together, box up the items, move it to the venue, set it up, tear it down, and send it back if it doesn’t sell. I’m sure you and your auctioneer put some thought into how many silent auction items you should have, and what types of items would appeal to your crowd. Stick to your guns. Thank you so much for your very helpful Advice! I am in charge of an auction to raise funds for a scholarship at our reunion. We are getting some donations but I was considering using a sports consigner. Now I know they will probaly send more than we want and I can just use a few of their items. Without you I would be totally lost! Thanks so very much. Information is power, Barbara. 🙂 Good luck with your event. How do you price consignment items? Susan, given that I’m not sure how you’re planning on selling these (raffle, live auction, silent auction, blind bid, etc), I think the best suggestion would be to figure out the minimum you’d want to make on each piece and price accordingly. For instance, one of my clients likes to guarantee she gets at least $500 on each package. Another insists that she wants $2000 or she’s not putting it in her auction. I’d also encourage you to listen to my Mastering Auction Consignment course for an in-depth understanding of what’s available to you.